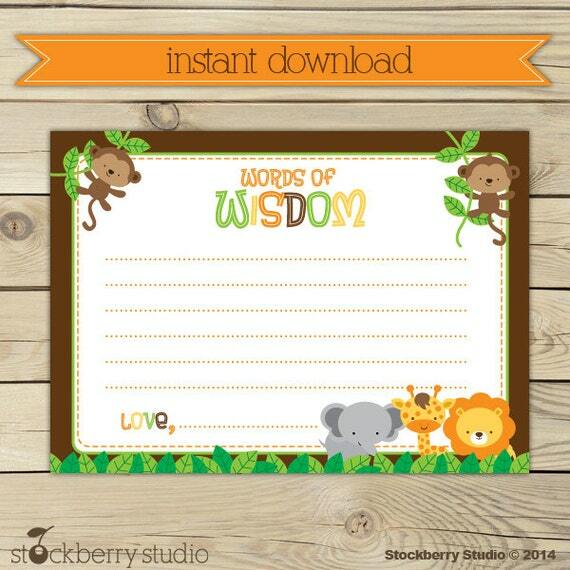 Words of Wisdom Printable Baby Shower Game Safari Animals. Print digital file and use for a baby shower game. ► At checkout please leave a detail note of the verbiage changes you would like on your printable. ■ A download link will be sent INSTANTLY to your EMAIL ACCOUNT you have on record with ETSY within 5 minutes AFTER your payment is completed for you to access the files. ■ Please DO NOT leave YOUR EMAIL ADDRESS in the NOTE TO SELLER are during checkout. This is an automatic DIGITAL DOWNLOAD & it will be sent AUTOMATICALLY to the email address you have on file with Etsy. Thank you!. ■ Files WILL NOT be physically shipped to your home address. The download link will be sent to the email address you signed up with for your Etsy purchase.